Recently, I had an experience where I thought I had everything thought through and designed. I even ran my idea by a friend of mine that I trust. Everything was a green light to go. I designing a soap cutter. My wife buys raw soap materials in 12 in x 12 in x 7 in blocks. The soap has to be cut down to small chunks so it can be melted and poured in to molds. Currently, it takes me an hour and a half to cut a block into the desired size chunks. It is not fun but it has to be done. In the name of continuous improvement, I wanted to design a cheap way to cut the soap quickly and more easily. I also wanted to design and test in stages so if the design was not working it was not costing more and more money. The first step was to get the tool to cut the block into 1 in. strips with one cut. 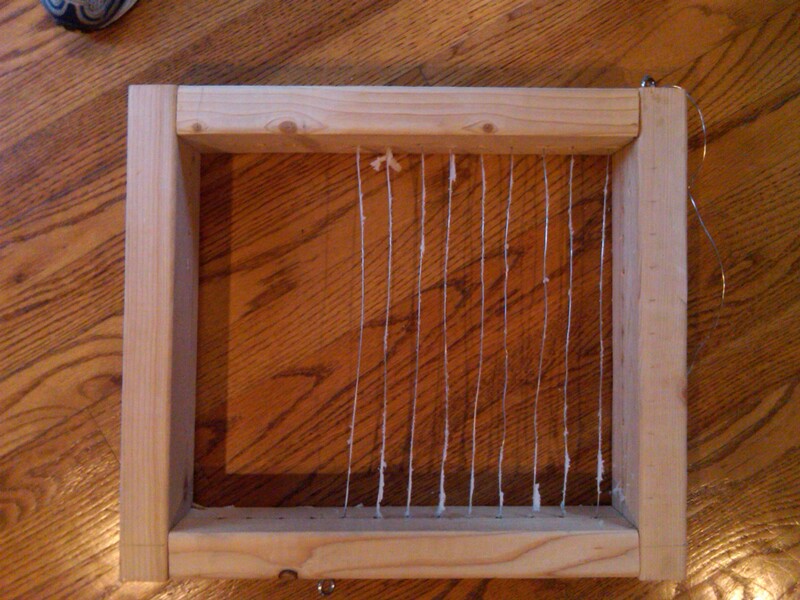 I made a wood frame and then threaded steel wire through the frame. The idea would be to push the frame down through the block using the wire to cut the soap. The picture to the side is of the tool. Building went well except the wire broke so I only threaded it three quarters of the way through pulling the wire tight. I went to give it a try and needless to say, I only cut maybe an 1/8 of an inch through the soap. The wire was being stretched and even standing on the darn thing, I did not have enough force to push it through the block of soap. It was almost a complete failure. I didn’t get through the soap but I learned quite a bit. For one, I am glad that I was building the device in stages. I had planned to cross thread the wire which would have taken another hour do to form something that didn’t work. The last stage was to add a mechanical way use the device. Now I know I have to move the mechanically driven portion up in the timeline in order to get enough force to drive the wire through the soap. I also figured out I will have to weave the wire to make it stronger when I add the crossing the wire. Think of stringing a tennis racket. This is just a small home project but by breaking the design up and not spending a lot of time building it to complete specification, my feedback loop was quick and added learning to designing the device quicker and at a much lower cost. I spent less than $5 on the first version and about 3 hrs including my trip to Lowe’s (what’s a project without a trip to Lowe’s). If I would have built the entire think as I picture it in the end, it probably would cost around $100 and taken me a good 25 hrs plus to build. I would have been severely discouraged if that didn’t work and who knows if I would have tried again, because i wouldn’t want to make that invest twice. Now I shrugged off the failure, took the lessons learned and will apply them to a second version. When designing a product or device, take quick less costly iterations and test and make but do it with a long term vision in mind. Streaming TV is a good example. It started with DVDs on the computer. Then slow choppy video over the internet that got faster and smoother and then to HD. Then boxes where designed to connect to your TV to receive an internet signal and view video on your TV. Now TVs are built with internet connection built in and apps to watch video from Netflix, Hulu, Crackle, etc… Next will be selecting a menu of things you want to watch and subscribing to it and watching live over the internet eliminating Cable TV. Pick NBC and FOX and pay $10/month and the shows stream to your TV. What failures have you learned from?